Spinal stenosis is the narrowing of spaces in the spine (backbone) which causes pressure on the spinal cord and nerves. Leg pain with walking is medically known as claudication, and it can be caused by either arterial circulatory insufficiency (vascular claudication) or from spinal stenosis (neurogenic or pseudo-claudication). Leg pain from either condition will go away with rest, but with spinal stenosis the patient usually has to sit down for a few minutes to ease the leg and often low back pain, whereas leg pain from vascular claudication will go away if the patient simply stops walking. 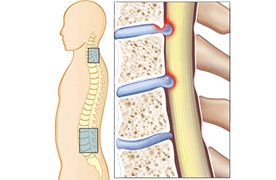 Symptoms of lumbar spine stenosis usually include leg pain (sciatica), numbness, tingling and/or burning. In severe cases, there may also be leg weakness. Low back pain may also be present, however the leg pain is usually more severe. In lumbar stenosis, the spinal nerve roots in the lower back become compressed and this can produce symptoms of sciatica—tingling, weakness or numbness that radiates from the low back and into the buttocks and legs—especially with activity. For lumbar stenosis, flexing forward or sitting will open up the spinal canal by stretching the ligamentum flavum and will relieve the leg pain and other symptoms, but the symptoms will recur if the patient gets back into an upright posture. Numbness and tingling can accompany the pain, but true weakness is a rare symptom of spinal stenosis. Spinal stenosis pain in the neck is called cervical spinal stenosis. This condition means that there is potential compression of the spinal cord. Unfortunately, the spinal cord compression can lead to serious problems such as extreme weakness, or even paralysis. With cervical stenosis, anyone who develops signs of spinal cord compression (myelopathy) may need more invasive treatment, such as surgery. Thoracic stenosis can also occur, but is less common. The thoracic part of the spine is the middle/upper portion of the spine, and mainly consists of the vertebrae that are attached to the rib cage. This stable and strong part of the spine allows for minimal movement, which is why degenerative conditions such as spinal stenosis are less likely to develop. MRI scan and/or a CT with myelogram can show the tight canal and spinal cord pinching associated with myelopathy from stenosis of the cervical spine. A suitable program of physical therapy and exercise is a component of almost every spinal stenosis treatment program. While the spinal stenosis exercises are not a cure, it is important for patients to remain active as tolerated and not become additionally debilitated from inactivity. Patients are usually counseled to avoid activities that worsen their spinal stenosis symptoms. For lumbar stenosis, patients are typically more comfortable while flexed forward. For example, recommended activity modification might include walking while bent over and leaning on a walker or shopping cart instead of walking upright; stationary biking (leaning forward on the handlebars) instead of walking for exercise; sitting in a recliner instead of on a straight-back chair. Staying active helps with emotional and mental health as well. Getting up and moving gets the blood and endorphins flowing and improves one’s overall outlook, which in turn helps reduce pain and improve physical symptoms. 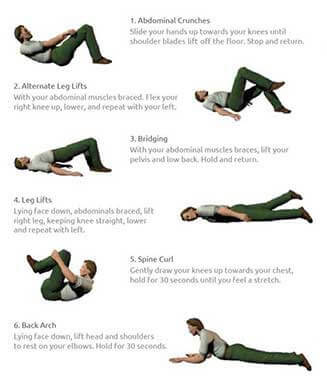 An effective exercise program for people with lumbar spinal stenosis usually includes a combination of range of motion, strengthening, endurance, and stability related activities. Patients often find that activities/exercises for lumbar stenosis that are done in a bending – forward position are more comfortable. Spinal stenosis is generally not progressive. The pain tends to come and go, but it usually does not progress with time. If the patient has a radiculopathy (myeloradiculopathy), conservative treatment like NSAIDS, activity modification and exercises for cervical stenosis may help relieve the arm pain. Conservative treatment for Spinal Stenosis include: Epidural injections and Medication Management with NSAIDS, Antidepressants, muscle relaxants, opioids for short term severe pain. 10-15% of patients will require a laminectomy for spinal stenosis treatment. The only effective cervical stenosis treatment for myelopathy is surgical decompression of the spinal canal. If there is progressive weakness in the legs, then spinal stenosis surgery should be considered on an urgent basis rather than delayed in order to reduce the chance of long term nerve damage. While decompressive surgery (lumbar laminectomy) for spinal stenosis generally has a good success rate for relief of leg pain and leg symptoms (such as ability to walk), it is less reliable as a treatment for activity-related lower back pain. You may be a candidate for a less-invasive procedure (for example, insertion of an interspinous process spacer, such as an X-STOP spacer) that can relieve symptoms without the need for a laminectomy. Not everyone with spinal stenosis is a candidate for this type of surgery. Because spinal stenosis is caused by degenerative changes in the spine, symptoms may recur a few years after surgery for lumbar stenosis.